Icebergs that break off from Antarctica can stay afloat in the Southern Ocean for years. 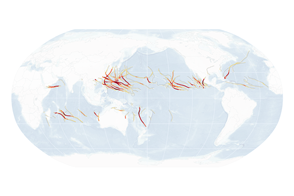 Some become stuck, while others drift in the currents that circle the continent. Where those currents are interrupted by South Georgia Island, some bergs make a northward turn. 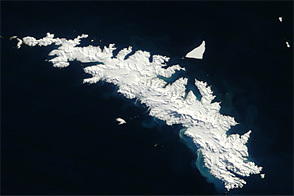 These images, acquired November 27, 2015, by the Moderate Resolution Imaging Spectroradiometer (MODIS) on NASA’s Terra satellite, show an array of bergs floating offshore of South Georgia Island, more than 1,600 kilometers (1,000 miles) east-northeast of South America’s southern tip. Their relatively northern location is not common, but not unheard of. What is interesting, though, is that some of them appear to be making waves—in the atmosphere. 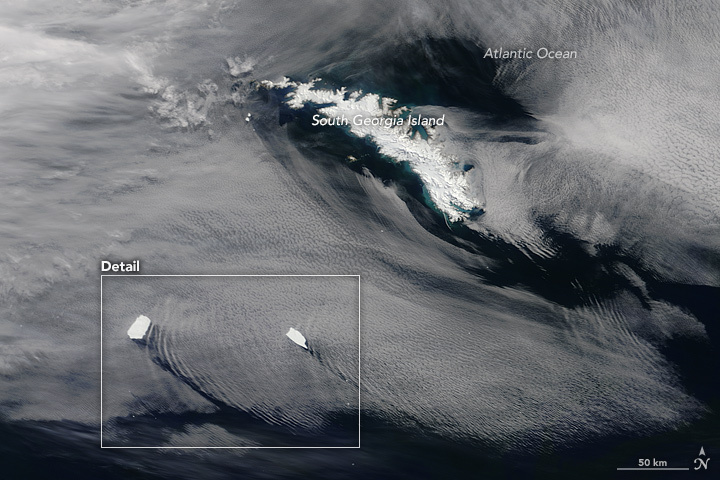 The second image shows a close up of icebergs producing a “cloud wake.” Just as a ship leaves behind a V-shaped wake in the water, tall bergs can leave behind similar wake in low-level clouds. According to Brunt, the three bergs are likely tabular—flat-topped ice that broke away from an ice shelf—which means they probably rise to roughly the same height above the water line (on the order of tens of meters). Such icebergs can come into direct contact with low-level fog to produce cloud wakes. 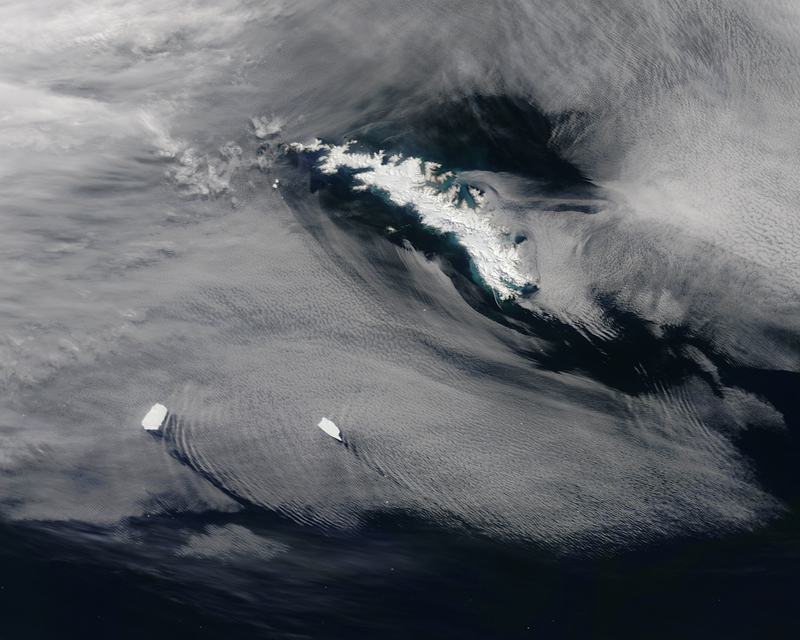 Two of the icebergs also made ripples higher in the atmosphere. “Wave clouds” occur when a higher-level air mass is forced to move up and over a large obstacle. 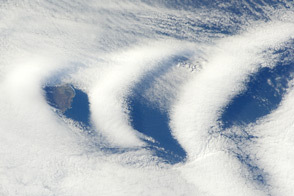 For example, wave clouds are commonly observed when air passes over islands. 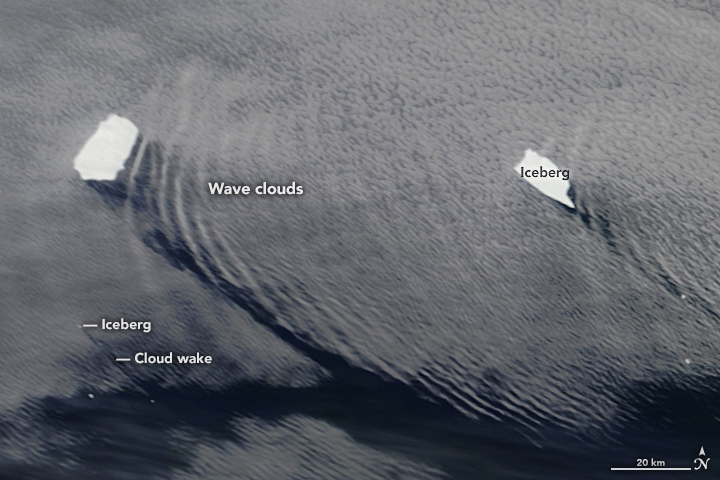 Unlike the low-level fog that leads to a cloud wake, the air mass that forms wave clouds does not have to be at the same level as the icebergs. It simply must encounter a disturbance large enough to force the air up, instead of around. 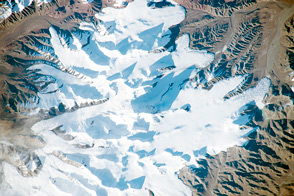 Like an island or ship, some icebergs are large enough to influence cloud patterns above.